Have you ever wanted to develop an app for your iPhone, but didn’t know how? MIT’s Scratch platform is intended for young would-be developers who are unfamiliar with code, but veteran code-slingers may also find a use in the software for quick prototyping. The Scratch.mit.edu website feels like a simple version of Newgrounds, with an emphasis on downloading and “remixing” existing projects (so novices can fiddle with live code). 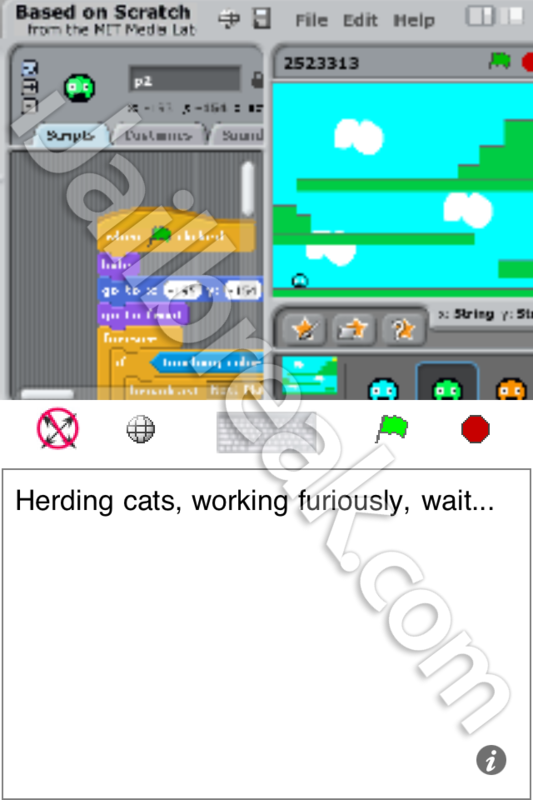 On a desktop computer the apps run through Java, and now Scratch projects can run on the iPhone or iPad with Scratch Player. A development environment so simple, even I can put it to use. Note the the absurdly small resolution of the app. The Scratch Player doesn’t pull projects directly from the iPhone’s local memory or from your computer; it has to pull content off of MIT’s servers, which requires a Scratch account. If you don’t have a scratch account, a handy dialog will take you directly to scratch.mit.edu/signup, where they’ll fix you up. The version of the Scratch Player in Cydia isn’t flawless. The player doesn’t appear to properly scale to the screen, at least not on my iPhone 4. Touch input is mapped to the entire screen, but the graphics show up in the bottom left corner and are just barely visible to the naked eye. If you zoom into the image, a large majority of the touch input will still be bound to that huge blank portion of the window which you just pushed offscreen. It is still possible to navigate touch apps, but only by leaving the display in its postage stamp sized form and then by working out where the buttons ought to be. This not ideal. The about page suggests that the actual app was written in 2010. My best guess is this is a direct repackage of the scratch viewer which was removed in the iTunes store (for providing access to content outside the store), and would have been created before the introduction of “Retina displays.” If this is the case, it should work fine on older iPhone models. I sent a bug report to the folks at mobilewikiserver, who originally published the (now defunct) app for the iTunes store. I got a prompt response, but was told to “try the fellow who posted the Cydia fork.” I sent another bug report through Cydia. We’ll update when we hear back from the developers. If you have an older iPhone, iPad, or iPod Touch and are interested in developing your own apps, you might be interested in Scratch Player. It’s available in the BigBoss repo for FREE in Cydia. Even if you have a newer iPhone or iPad with a Retina display, you still may be interested in producing content with Scratch. As this is a media lab project (all about community involvement) the development kits are free and available on Mac, Windows, and Ubuntu. Feel free to share links to your Scratch Projects in the comments section below. Learn How To Downgrade your iPod Touch or iPhone from iOS4 firmware to 3.1.3 firmware!